This pretty cross would make a perfect gift for the devout. Crafted of 14-karat yellow gold and lined with round-cut cubic zirconia from top to bottom and side to side. This sweet pendant measures 0.78 inches long.The pendant is completed with a matching 14k yellow gold 0.9-mm curb chain in 16 inches length. 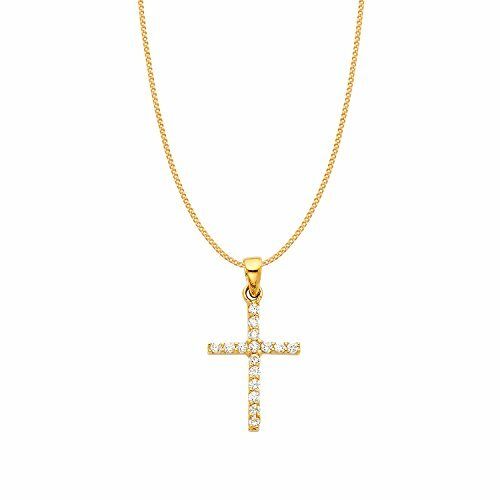 Unisex Sterling Silver 925 - 4MM Bead Chain - 36"
Solid 14k Yellow Gold Catholic Jesus Christ on INRI Cross Crucifix Pendant Necklace (1.6"), 20"
14k Yellow Gold 7-7.5mm White Round Freshwater Cultured Pearl Bunny Pendant 1/100cttw Diamond, 15"